Christina Adores...: Ciate Jubilee Nails! 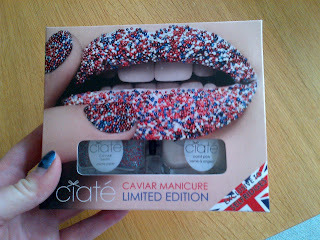 Ciate has developed a special Jubilee version of their amazing caviar manicure kit, exclusively available in Selfridges and online. Available on Thursday I snapped them up! 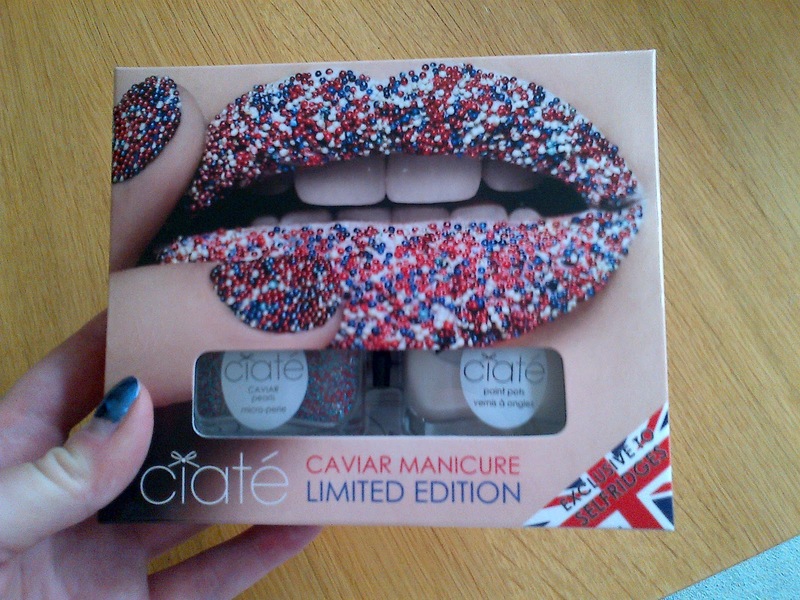 I've been wanting to try out the caviar manicure and a special Jubilee edition sounded perfect to me. Thankfully I received them on Saturday morning (thanks for the super speedy service Selfridges!) and I haven't been so excited about a beauty product for a while to be honest. Using the product is really simple and quick and gives you such an amazing effect. My only slight criticism is that the blue beads should be a deeper blue for the traditional red, white and blue of Great Britain but that is a very minor quibble. Firstly apply a base coat and then one coat of the pearly white polish. Being Ciate the polish is really good quality and goes on evenly. Leave that to dry for a while and then work nail by nail, applying a second coat of white and whilst this is still wet sprinkle the beads of the nail gently pressing them into the wet nail polish. The tray Ciate provide you with is fantastic, otherwise you would lose a lot of beads and your carpet would be covered! Plus you get a little funnel to then put the loose beads back in the bottle. Leave the nails to dry for around 20 minutes and then I kept gently touching the nails so that any semi-loose beads came off and you are left with those that are firmly in their place. The effect is beautiful. Love love love love LOVE!!! Perfect for this long weekend, but it isn't limited to just now. I'll definitely be wearing this lots in the future. Priced at £18 it is obviously pricier than other nail polishes but this is so unique and I think the set will last a long time as they give you a lot of beads. Get to Selfridges now and this is sure to sell out fast. Now time to show them off at my Jubilee street party! !